Unlike many of the other anthologies produced primarily for the furry fandom, Already Among Us draws on works by authors in the larger arena of science fiction, from the 1940s through the 2000s. The only "furry" author represented is Michael Payne--and with a story of his that appeared in Asimov's Science Fiction. While Already Among Us may have a little trouble getting beyond the furry audience, this isn't a problem with the story selection. Edited by Fred Patten. Cover art by Roz Gibson. Legion Publishing, June 2012. Hardback $18.99+$5 s&h, trade paperback $9.99+$5 s&h (389 pages); Kindle $8.99. Compare: dronon's review of Already Among Us. Classic works Patten's collected range from Fredric Brown's "The Star Mouse," the story of a mouse sent into space by an eccentric rocket inventor who comes back having been uplifted by aliens, to Poul Anderson and Gordon R. Dickson's "Yo Ho Hoka!," a novella from a famous series of short stories about aliens who look like teddy bears and have a penchant for adopting bits of Earth culture--both fact and fiction--making dealing with them a frequently farcical catastrophe. In this story, as the name suggests, the main human character is caught up by a group of Hoka who believe they're pirates. As with many tales from the golden age of science fiction, the scientific bits are often quite interesting, although it's hard not to notice how much resemblance the culture of these far-flung futures has to the mid-20th century West, particularly noticeable in William Morrison's nonetheless excellent "The Model of a Judge." Reginald Bretnor's "Dr. Birdmouse" is another comical piece imagining a very furry-esque alien world--all the aliens are essentially earth animals, but unlike most furry stories, they can all interbreed with one another. (Patten notes in his introduction to the story that one of the only other anthromorphic stories he can think of with this element is an obscure bit of Nazi propaganda whose author was actually sentenced to death in a war crimes tribunal, but I can think of one less outré: the world in which Roz Gibson's "Jack Salem" stories are set.) While all of the stories in this section are good, Cleve Cartmill's "Number Nine," about a lab rabbit who's been inadvertently gifted with human intelligence, is a standout. The stories are presented in chronological order. We leap from the early 1960s to 1990 with Martha Soukup's "Dog's Life," the first story by a woman author in the collection and a charming bit of if-pets-could-talk magic realism. Then comes Michael Payne's "River Man," a fantasy story involving multiple parallel earths (and the very "furry" one it's set on) and a human stuck on one. As usual, Payne weaves low fantasy, high myth and great characterization together effortlessly. Paul Di Filippo's "McGregor" is--well, hard to describe: one of the best takes on the trope of genetically engineered animal slaves/soldiers I've seen, a hard sci-fi Peter Rabbit pastiche, and stylistically excellent. Other stories include one told through postings on an online dating site for animals (Scott Bradfield's "Doggy Love"), a story about a scientist arguing with his uplifted lab rat who's been told about Flowers for Algernon by the scientist's daughter (Susan Palwick's "The Fate of Mice"), Mickey Zucker Reichert's amusing retelling of the Three Little Pigs ("All The Pigs' Houses"), and Harding Young's "Killer Kitty," which contains exactly what's on the label but manages to be smart and genuinely creepy rather than ironic and jokey. 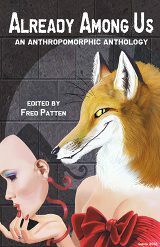 This anthology is, in many ways, a good reminder that while furry fans tend to use anthropomorphic to mean "human-sized, bipedal talking animals," in its more traditional sense it simply means giving non-human things human characteristics. Very few of the animal-people in this collection look anything like humans, but all of them behave like humans in many respects and all of them can communicate with humans. I'd like to see more authors and creators working within the fandom to familiarize themselves with these kinds of "furries"; for all of our creativity, our works can sometimes feel a little inbred--many furry writers (and artists) working today seem to have few direct influences outside furrydom. This is a worthy collection for any furry fan willing to step beyond the fandom's walls. I noted that this collection may have trouble reaching a wider audience. The problem is not the content but the typesetting. From using ragged right, unhyphenated Verdana as the body font (except for the bits where they used Arial accidentally) to inconsistent use of em dashes vs. hyphens, straight vs. "smart" quotes, even italics vs. underlines--somebody at Legion needs to learn desktop publishing basics. I want to reiterate that the collection is worth buying in spite of these problems, but the stories deserve better. This anthology contains fourteen stories. My wish-list was for fifteen stories, but I was refused reprint permission for the story that I wanted most; "Jerry Was a Man", by Robert A. Heinlein. Go and find it in another s-f anthology or in Heinlein's short fiction collection, Assignment in Eternity. It is one of the best anthro stories that I have ever read. I would like to thank Roz Gibson for the cover of my book, too.